New from the Gregrox Space Probe Agency, a new series of comfortable flight suits built for probing the depths of space in starships. Designed to be airtight in an emergency thanks to KSP-approved gloves and helmet-locks, these new shirts, pants, and tunics are great for those moments when you really need to relax in full technicolor splendor, while on a trip to meet some hot alien babes or stop a god made out of an energy-tofu hybrid from taking over a race of nuclear beans, or perhaps just to stop the Klingons from stealing all of your snacks. 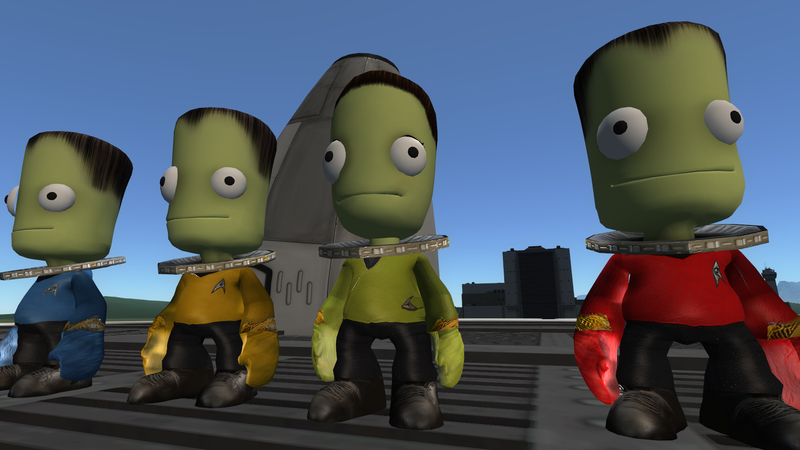 Thanks for downloading Star Trek TOS Tunics!